This house has never looked better. And to think that this house was almost a ruin just a short time ago! The photo of the fireplace (#14) looks like an iron sheet has been placed at the back of the firebox. To assist in drawing smoke up the flue? The bench in #27 is very interesting. A good contrast to the rectilinear nature of the blocks. I've had several friends stay there since it opened as a rental and were very impressed. The owners sound like extraordinary and exemplary custodians. I'm impressed -- and pleased. SDR: You need to design them a more Wrightian picknick table (photo 31). 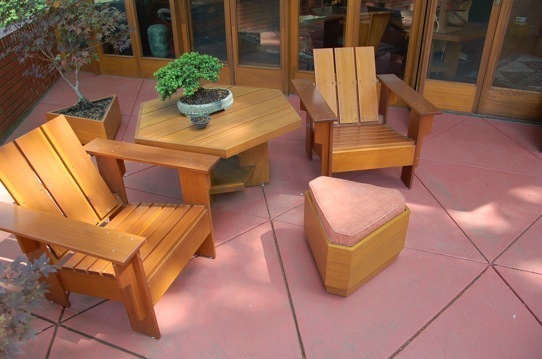 Daniel Chrzanowski (Dobkins House) has designed a more Wrightian chair to replace those Adirondack chairs. and natural material. Perfect ! I like it better than that crafty bench thing in the former carport . . . But thanks for the reference, Paul ! The vernacular American picnic table (as seen at Epstein) is a masterpiece (imho), and an icon of modern design. I’ve been recently trying to find out more about its origins. Another great design is the folding “director’s chair”. Anybody remember the "Do Normal" movement from the Netherlands ? I can't find anything but this page. You might ask Aaron Betsky about it ...He is now at Taliesin.